Do you think you are a lucky slots player? Click here to play! Do you think you can prove it? If so, them put your luck to the test playing the Fortuna 3-reel classic slots. Featuring up to 5 active paylines with a maximum jackpot of 6,000 coins, the Fortuna slots are the ultimate test for the expert classic slots player. 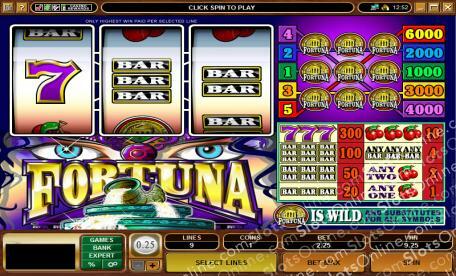 These slots feature red cherries, single BAR symbols, double BAR symbols, triple BAR symbols and lucky 7s. This makes them much like any other classic slots game. Where they differ is the special Fortuna symbols that win jackpot amounts when 3 land on the same payline. With jackpots ranging from 1,000 coins to 6,000 coins, scoring a Fortuna symbol win on these slots is real proof of your luck as a slots player. Test your fortunes now by playing the Fortuna slots, the slots game that dares you to challenge Lady Luck - and win. The Fortuna symbol is wild in this game, and it can substitute for any other symbol.